Description: This poster is an offset litho in black, produced by the Learn and Teach, Johannesburg. This poster celebrates the role of women in the struggle and challenges male exploitation of women. 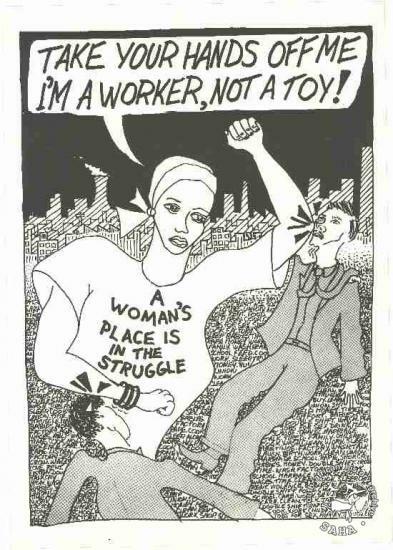 The text reads: "TAKE YOUR HANDS OFF ME I'M A WORKER, NOT A TOY! : A WOMAN'S PLACE IS IN THE STRUGGLE". Digitised by Specialised Archival Solutions in 2009. Reproduced in "Images of Defiance: South African Resistance posters in the 1980s" on page 87 (number 153) of the 1991 SAHA / Ravan Press edition and the 2004 SAHA / STE Publishers edition. It also appears on page 124 of “Red on Black: The Story of the South African Poster Movement”, SAHA / STE Publishers, 2007 as well as the SAHA exhibition kit and virtual exhibition, titled 'Women hold up half the sky: commemorating women in the struggle'.